Our expert software WINISO® has been extended by the calculation according to the American standard ISO 15099. 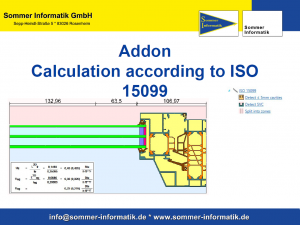 The “ISO 15099” add-on is available for this purpose. With the add-on “ISO 15099” the relevant calculations of Ufr-, Ueg- and Ucg-calculations according to ISO 15099 and NFRC can be carried out. Once the calculation is complete, you can generate the printout specifically for ISO 15099 and receive a list of the materials used. The calculation results with the corresponding Imperial units are also specified.